If this black and gold kitchen doesn't make your jaw drop like it does ours, this trend just might not be for you. But, here at Whitestone Design Group, this Design Trend has snagged our attention and we don't foresee this trend going anywhere soon. Black and Gold will be huge in 2018. The black and gold design trend is a versatile color combinations that lends itself to a lot of different design styles and is capable of making your home look and feel exclusive. Black and gold is generally identified as a luxurious color combination, and its certainly setting the bar when it comes to interior decor at the moment. With the presence of black and gold in your space, your home will most definitely gain a unique look that is sure to distinguish it from others. The two colors together are perfect for creating wonderful sense of an elevated interior. Below, we will highlight to you some of the reasons why the combination of the two colors is taking over and making waves in the Design Industry as one of the hottest trends for 2018. If you ask interior designer about what it is that black and gold colors bring to their work, the answer would be: Fabulousness! The two colors combined together to bring a touch of elegance to a space. The colors can be used together exclusively or in addition to other colors when decorating a room to give it a vintage style vibe and can be utilized with furniture and accessories to exude that "Art Deco" feel seamlessly. Farmhouse, you got it! Modern, black and gold can be added with ease. It's that perfect color duo that works with all design styles and rarely disappoints. Who doesn’t love a little bit of luxury? Everyone wants to have the feeling that they can buy whatever, whenever. Using a color combination that has been frequently found in palaces and high-income homes is a no brainer when attempting to achieve that "life of luxury" look you might just be going for. Add a little... Add a lot! How far are you willing to push your style?! 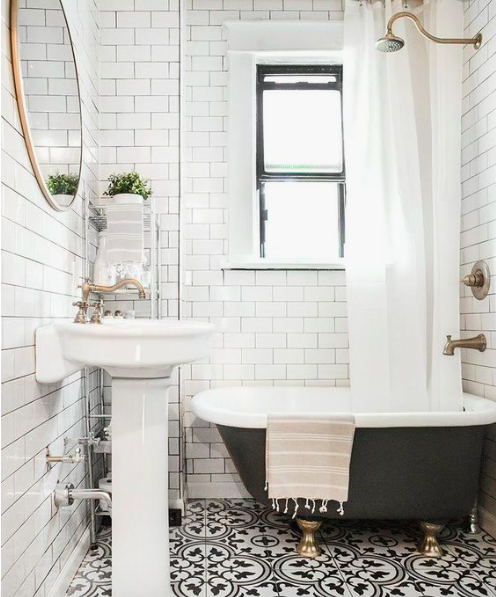 Using the colors black and gold to decorate the powder room or a master bath, for example, makes it look entirely different from 2017 dominate design trend of an all-white lavatory. Some of our favorite examples of how impactful the color trend is has been in kitchens and, of course, bathrooms. Who knew bathrooms could be so exciting?! There really are no limits to the use of these colors. If you have taken a good look at the homes that make people stop and stare lately, we're noticing that it's the furniture and decor that really makes it stand out. Especially in neighborhoods where the homes are starting to use the same floor plans and construction materials. Using the two colors – black and gold – in a combination seems to bring out the value and quality of the furniture. The two colors are timeless and definitely make one heck of a DIY project. The same thing goes for accessories. Gold accessories have been nudging their way in for awhile, but the combination is fresh and new. In our opinion, every room looks better with a bit of black. What are your thoughts? Is this trend for you? Could you make the black and gold design trend work in your home, even if just in a small way? Share your projects with us! We'd love to see them and share how our readers are making moves in the 2018 Design Trend that we are crushing on!